Norwegian author Linn Ullmann has had one very strict rule for all interviews since 1998, when she published her first novel: Do not ask me about my parents. This rule held steadfast for her next four novels. Nevertheless, for her sixth, Unquiet, she may have to relent, if only a bit. Ullmann and her father, a respected filmmaker, had wanted to write a book together. They spent about two years discussing it in general terms before she began the process of recording long discussions with him at his house on a Baltic island, where he had moved permanently a few years before. But by then he was in his late 80s, and his age and infirmity caught up with them. She was only able to make six recordings of their conversations before he became too infirm to continue. Not long afterward, in July 2007, he died at the age of 89. Their book could never be written. Grief-stricken, Ullmann put her notes and the recorder away and forgot about them. But several years later she came across them again and forced herself to listen to those final exchanges with her father. These became the impetus and foundation for Unquiet. 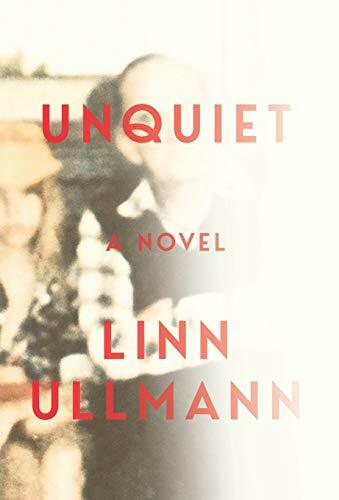 So Ullmann is calling Unquiet a “novel” to allow for the fact that one’s recollection of the past may be misremembered, incomplete, or simply wrong. This also gives her the freedom to tell her story in the way that seems closest, not necessarily to facts, but to the deeper truth of a child’s emotional connection to a parent. Naturally, it is anything but straightforward. As if to mimic the foibles of memory, the narrative is selective and sometimes repetitive. It jumps around in time, occasionally seeming a bit random, but slowly casts light on their relationship. She begins by describing her visits to that same island house as a child, where she spent a whole month each summer with just her father and a couple of his other children. (Ullmann was the youngest of nine, from six different mothers.) She recalls his need to work alone, undisturbed most of the day. The scheduled times for speaking to him. And always watching films (though not his) in the evenings, from the very first. True to the spirit of her interview rule, Ullmann never refers to her parents by their names. They are “Mamma” and “Pappa,” although now and then she uses the third person, referring to herself as “the girl” while calling her parents “the father” and “the mother,” as if to somehow back away to an impartial distance from what is going on. Ullmann significantly omits any detailed discussion of the decades between her mid-teens and those final interactions with her father. Her years as an adult—having a career, marrying twice, raising children of her own—are not held up to be compared or contrasted. In so doing, she keeps the focus on the lasting impressions of her father she retains from her childhood, now brought into relief by the reversal of roles during the last weeks, days, and hours they spend together. Similarly, she doesn’t refer to any of her father’s films or any of the well-known actors and actresses he worked with. Even when we learn her mother is in a show on Broadway, we are told almost nothing about it, not even its name. Ullmann does mention her father’s stage productions on occasion, but they are never really discussed, just put forward as evidence of the passions that drove him. And so this pendulum of memory swings between childhood and final parting. The mystery, joy, and excitement of those long-ago summers brought back fondly to mind as her father’s vigor and strength, and above all his own memory—finally succumb to age. In Ullmann’s artful hands, the sadness of witnessing the physical and mental decline of her father has been transformed into a unique and intimate recitation of a child’s love. An afterthought: Revealing the identities of Ullmann’s unnamed parents is certainly no spoiler, but it’s almost as if her American publisher felt that either people in the US wouldn’t know who they were or that the secret should be kept, to be consistent with the novel’s narrative. The cover of the American edition has an enlarged section of a photograph on the cover. But it is blurry and washed out. The faces are anonymous. One can just make out a little girl seated next to a man. The Norwegian edition, De Urolige, shows the whole photograph, also a bit blurry, but the faces are clear enough. The man is recognizable. In Scandinavia, of course, there was no need for a sharp photo. Everyone knows whose daughter Linn Ullmann is. She does not carry her father’s surname. Because her parents never married, she was baptized with her mother’s her mother’s name: Ullmann. As in Liv Ullmann, the Norwegian actress. Her father, of course, the man on the book’s cover, was the famed Swedish director Ingmar Bergman.